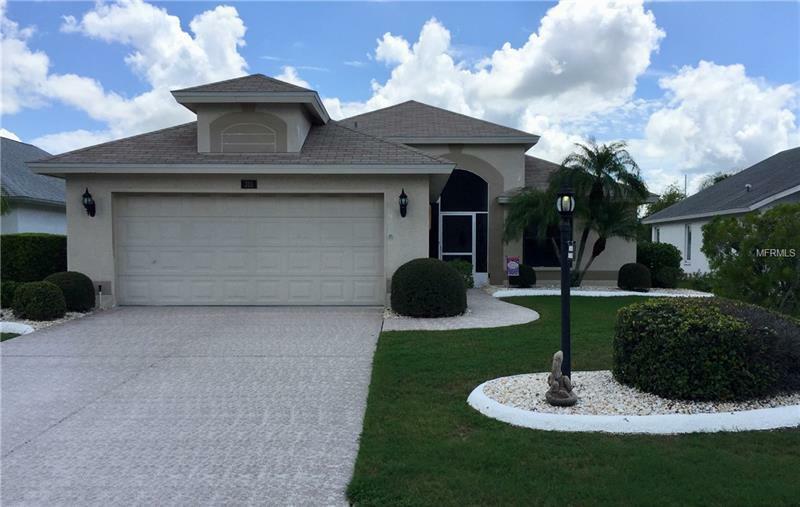 If you are looking for a quiet, peaceful neighborhood, don't miss this move-in-ready home in the pristine Caloosa Lakes area. This Barbados plan offers a large kitchen and eat-in area with a pass-through to the living/dining combo. There is also a built-in desk. The vaulted ceiling in the living room adds to the beauty of this open plan. The master bedroom has a large walk-in closet with a built-in fan to keep your clothes fresh. The screened front porch as well as the lanai offer sitting areas to relax and enjoy the fresh outdoors. The new roof along with a new garage door opener and a water softener add to the charm of this well-maintained home. The two-car garage has storage and pull-down stairs to the attic for additional storage. Live your dream with over 200 social clubs, pools, state-of-the art fitness center, and many other sports activities such as golf, tennis, pickle ball, softball just to name a few in this popular 55+ community. Want more? Then take a short drive to Tampa or Sarasota for cultural and/or sports events, beaches, Busch Gardens or drive another hour to all the Disney/Universal parks. Live the vacation lifestyle all year long. Don't wait too long to make an offer on this well-priced home. Amenities Additional Fees: Community Assn. fees $279 per person annually.